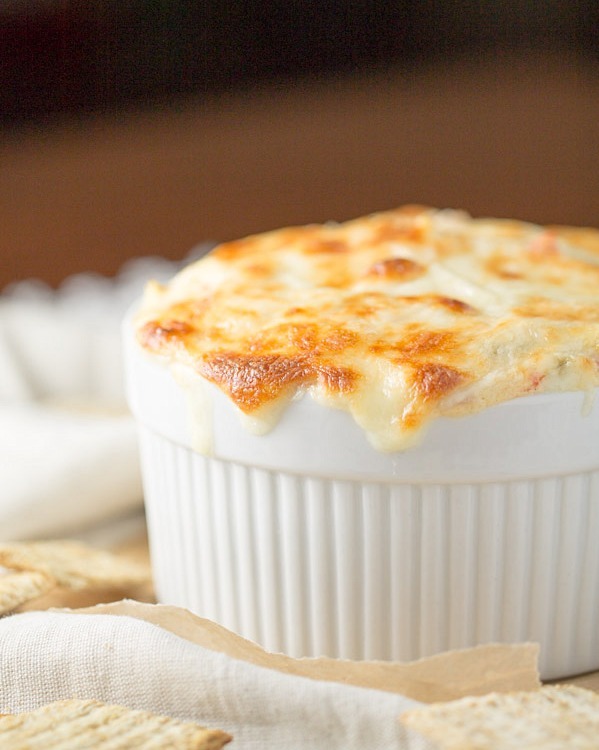 This Hot Seafood Artichoke Dip is filled with a creamy spicy sauce, artichoke hearts and seafood. 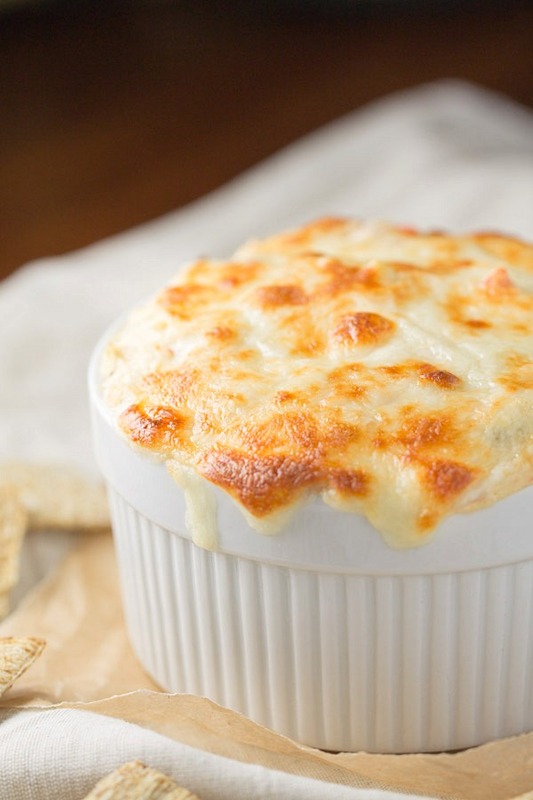 Top it off with some gooey melted cheese to give it that extra dose of cheesy goodness! 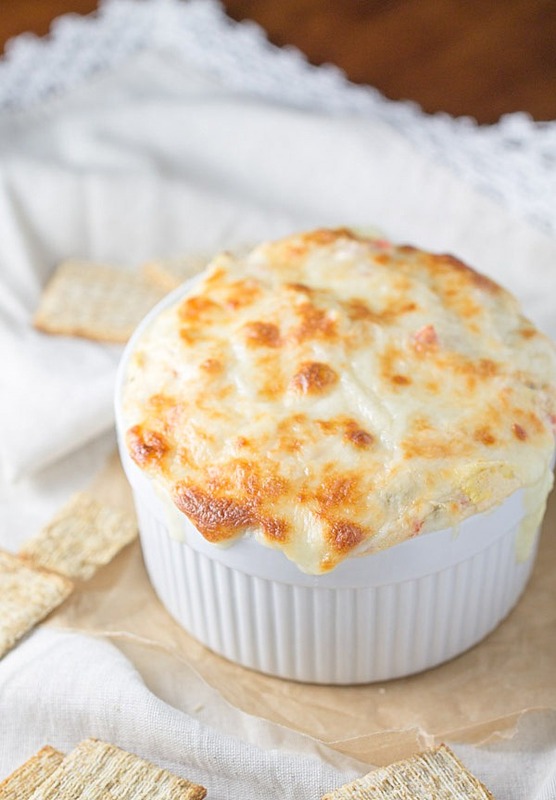 You guys, this Hot Seafood Artichoke Dip is crazy good. Seriously, just thinking about it is making my mouth water. Too bad I don’t have any left. It was completely devoured shortly after I made it. Forget dipping crackers in it. I was eating it from the spoonfuls, right out of the little ramekin I baked it in. My favorite type of appetizer is anything that falls into the Southwest/Mexican/Tex-Mex genre. Give me quesadillas, nachos or southwest egg rolls and I’ll probably eat all of them. Oh my gosh. And give me anything that is an appetizer sampler and I’ll be the happiest gal on Earth for that very moment. One of my favorite restaurant past times is ordering either the Southwest Egg Rolls or Appetizer Sampler from Chili’s or Bennigan’s. Do ya’ll remember Bennigan’s? I used to go there quite often in my younger days. Go out. Have some drinks. Get some good food from Bennigan’s. Too bad all of them sans one shut down in Florida. It was a sad day when I heard that Bennigan’s was going to shut down but that’s ok. I moved on. I moved on to spinach and artichoke. Spinach and artichoke appetizers made at home. Oh and Chili’s has good spinach and artichoke dip but it’s so easy and cheap to make it at home so I’ll take it at home. If you missed my Spinach and Artichoke Wontons, you can find the recipe here. They’re the perfect little bit sized treat. And if you’re like me, you’ll be eating the dip right from the bowl before it even makes it to the wontons. A few weeks ago I realized I had all of the ingredients to make one fantastic dip. I had some imitation crab meat (don’t hate, I love that stuff) artichokes, cheese and Greek yogurt. Yes! The not so secret ingredient in this dip is the Greek yogurt. I used it rather than using sour cream. In a mixing bowl, combine all ingredients minus the mozzarella cheese. 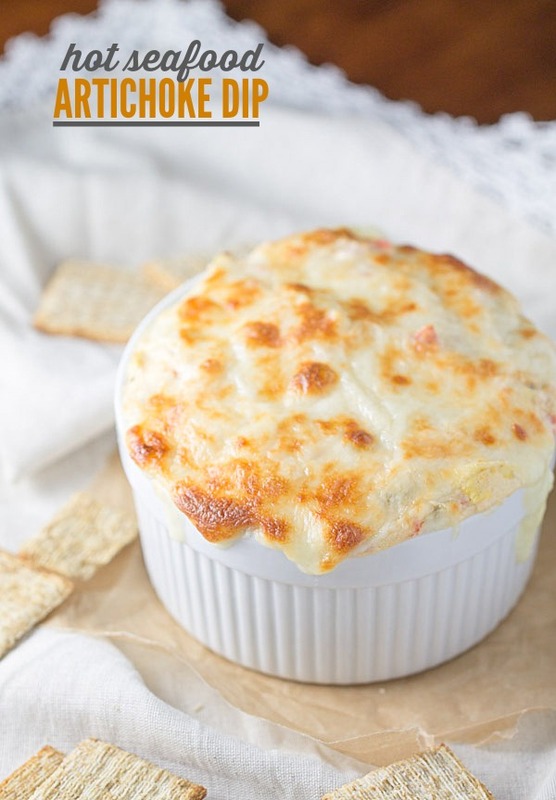 Place into a 10oz ramekin or a small casserole dish. Top with the mozzarella cheese. Place the dish on a baking sheet and then bake for 20 minutes. Right at the end, turn on the broiler and broil until the cheese is bubbly and golden. Um, ok. For real, this just sounds amazing. I say that a lot and I need to come up with other adjectives but my mouth is watering and my brain is fuzzy. Pinning for later!! 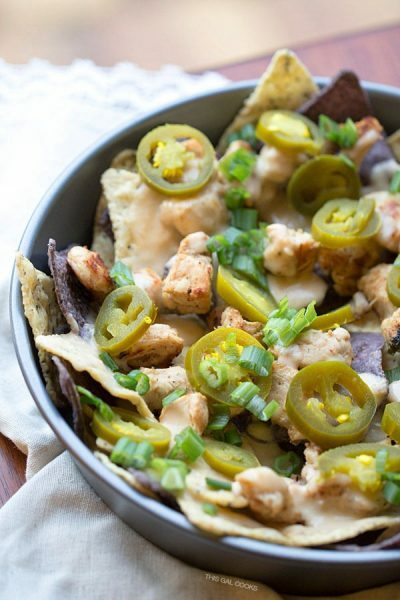 This cheesy melty goodness just sounds amazing!! Pass the spoon please. 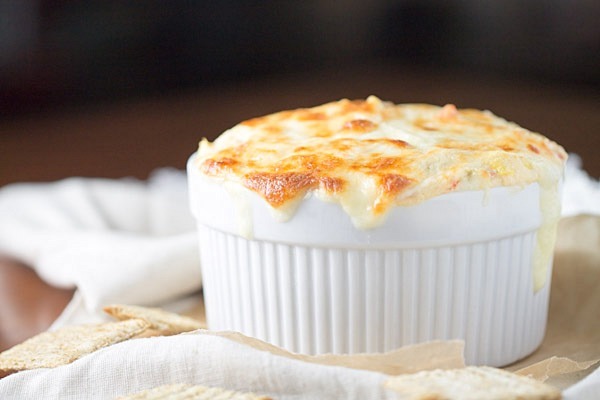 I just happen to have 2 cans of lump crab meat, which I will try with this dip for a family gathering. It looks so delicious!! YES! 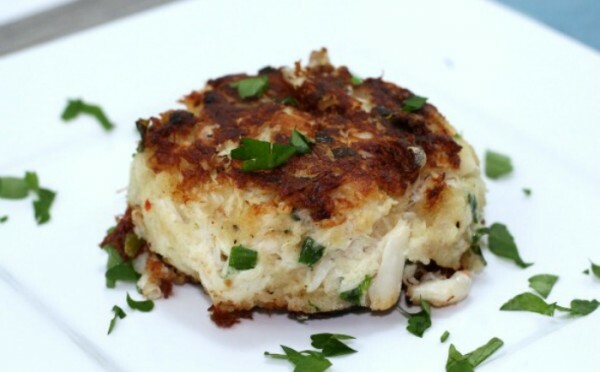 I think this would be great with lump crab meat. I hope you enjoy the dip, Joanne! Wow Julie, it’s only 8:00 am, but I really want this! It’s looks absolutely perfect! I’m not sure I’ve heard of imitation crab meat, but I’ll take your word for it that it’s good. Anything crab-tasting is good by me, in fact. You don’t see a lot of these hot dip type things over in Europe, but I reckon we’re missing out! Sounds very tasty, and really easy to make as well. I love the mayo-Greek yoghurt combo – just used it in a salad yesterday! I grew up in Maryland and LIVED off this in summers- it was delicious and this looks so too! I love that you’ve added in yogurt to lighten it up… looks delish! Sriracha is a type of hot sauce. It can often be found in the Chinese food section of a grocery store but I’ve also seen it in with the other hot sauces such as Tabasco, Texas Pete, etc. Hope this helps! I don’t eat artichokes very often and would not have thought to use them with seafood. Thanks for linking up and sharing your recipe with us at #overthemoon link party. They pair well with seafood! Pingback: Great Ideas -- 18 Fall Food Ideas! Pingback: Great Ideas — 18 Fall Food Ideas! – user's Blog!